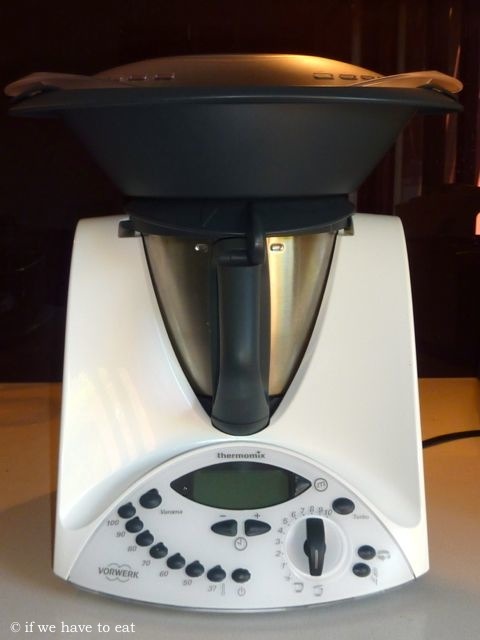 I was first introduced to the Thermomix by a friend who is a consultant here in Sydney, Australia. I attended my first demo at her house and while I loved the way the Thermomix made icing sugar from raw sugar and kneaded bread in just minutes, I wasn’t sure that the $1939 price tag was worth it. Over the next few months, I’d visit my friend and she’d make us dinner using the Thermomix – a seafood risotto, a Vietnamese style chicken soup, mashed potatoes…. And I started getting a better idea of how I might use it in my kitchen. So, I set about researching all of the different things that I could cook in the Thermomix to decide whether I could convince myself and my other half that this expensive toy could actually make a difference. I have always cooked a lot and have always managed just fine with my stove and oven, so there had to be enough reasons to take the plunge. I read a lot of reviews and browsed through the blogs and recipe communities. 1. You can set the timer and walk away – no manual stirring required (good for things from white sauce to stews). It is much easier to multi-task when you don’t have to worry about one of the things that you’re cooking. 3. The steamer (Varoma) – I like the idea of steaming food but have only been able to do it on a small scale with my small rice cooker. 4. The layered cooking (make your sauce while steaming your vegetables) is a great time saver. 5. We didn’t have a full-sized food processor, so I didn’t have to buy one of those (Note: the Thermomix doesn’t grate things but I do have a little Tefal Fresh Express that does the trick). 6. I got given a bonus at work and we had some money from our wedding we hadn’t used. 2. Steaming fish – the first day I got the thermomix, we steamed salmon while making the Thermomix stock concentrate. I then pan seared the skin to get that added crisp. It was so moist and delicious. Recently, we steamed a 1kg barramundi – worked beautifully! 3. Actually shorter times to cook some things – pancake batter in 30secs, awesome whipped mashed potatoes from scratch in 25 mins! 5. Silky smooth soups – I used to use a hand mixer to make soup (blitz it up after cooking) – but the Thermomix can do it so much faster and smoother than I ever could do with the hand mixer. 1. Too much liquid when cooking stews, curries, etc – I’ve been following the recipes in the Everyday Cookbook that comes with the Thermomix and every single time, there has been too much liquid left in the final product. On the stove, I can reduce off any excess liquid, but you can’t do that very well in the Thermomix. I think I am going to have to start reducing the liquid in all of the recipes. 2. Beat up meat – when cooking stews, curries, etc, the chunks of meat get a bit shredded by the blades (even when using the reverse and soft stir options). It still tastes fine, it’s just you get bits of shredded meat in your sauce which isn’t very attractive. 3. You really have to be careful when chopping things – 1 second too long and you’ve got mush! Practice makes perfect and I think I’m getting the hang of it now, but it at first, it was very frustrating. All up, is it worth it? The answer to that depends on what you want it for – what your expectations of a $2000 machine are. It does all of the things that I wanted it for plus it’s provided some extra benefits that I wasn’t looking for. It’s a lot about what is important to you – you can pay the same amount of money on a flat screen TV or a DSLR camera – I wouldn’t spend that amount of money on those things, but I love cooking and I love food so for me, the value is there. I got my Thermomix only on Friday and I love it. well worthed the money ( In Ireland cost 1120E).before I didn’t understand what was all that fuss about but now I know. Is the vegetable korma ok to freeze? I have 60 people coming and would like to make it in advance. If not freezable, how long beforehand do you think I could make it and re-heat? Hi Kerry, Wow – 60 people! Sounds epic! I’ve never frozen the vegetable korma before. The only issue might be the milk and the texture after thawing. Perhaps you can try making one batch and freezing it to see what happens. Alternatively, If it was me, I’d make it 2-3 days in advance and store in the fridge. Karen. P.s. One additional thought, beans and peas will go an ugly green colour after cooking and cooling. Consider cooking those separately on the day and adding before serving. Thanks so much for this advice. I will cook it 2 days in advance and add the greens at the last minute. We are having a Bollywood night fundraiser for our daughters school in Cambodia. We live in Western Australia. I have already made 10 kg of mango turmeric sorbet, 1 kg of tandoori paste ready for the chicken, 2.5 kg of butter chicken and today I am cooking 3 kg of pork madras and 3kg of beef rogan josh. Luckily I have a week off work! Sounds amazing! Good luck with the fundraiser!